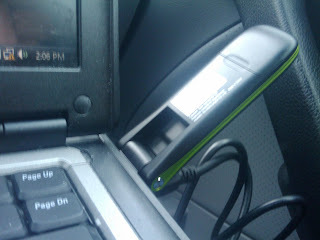 I had this brilliant plan to make my road trip to New York City this weekend a productive one: I would buy T-mobile's webConnect laptop stick in the morning and use it to make the 4 hours in the car Net connected. Surprisingly, I was able to buy the device this morning with minimal fuss. I mean, the transaction did take an hour and a half (closing on house was easier), but to T-mobile's credit they did keep all the discounts on my account and other goodies. I was promised the device was "Plug n' Play" and would be ready to use in 15 minutes. We got on the road, and I decided to plug the sucker in. The install process was fine, and a reboot later I was to connect to the internet while cruising up route 95. It was a big no-go. I got some error about the connection being in use. I called my buddies at T-mo tech support. They were kind enough to fix that error. But now I get error 633: the modem (or other connecting device) is already in use or not configured properly. Two hours of fiddling later, the connection still doesn't work and work that I could have done on my laptop unconnected remains incomplete. T-mobile tells me I need to give them 24 hours to let the service get fully in sync with my account and then I should call them back. I love my Verizon EVDO USB card. Can't live without it, and the bandwidth is surprisingly good. I use my blackberry curve in modem mode (shh...don't tell US Cellular) on the train all of the time. Works great and I don't have to carry about another peripheral. I use my rooted G1. Worked great when we drove to Miami this past summer... I was able to surf the net at well 3g speeds... well really only Edge since many areas still don't have T-Mobile 3G yet. One of these days I have to try out Lauren's new Samsung Jack with AT&T... she has a corpate plan and it actually includes 'legal' tethering.